The 5,000MW Waigaoqiao coal-fired power station in Shanghai, China, was built in three phases. Photo: Siemens press picture. The turbines and generators for two 900MW supercritical coal-fired units of Waigaoqiao Phase II were supplied by Siemens. Photo: Siemens press picture. The Waigaoqiao power plant (Phase II) was commissioned in 2004. Photo: Siemens press picture. The Waigaoqiao Phase III power plant consists of two commissioned in 2008. Photo: Siemens press picture. The 5,000MW Waigaoqiao Power Station, located in the Pudong New Area of Shanghai, shares the distinction of being China’s largest thermal power project with the similar capacity of Guodian Beilun power station in Zhejiang. The power station is owned by the state-run China Power Investment Corporation (CPIC) through its subsidiary Shanghai Electric Power Company. Shenergy Company is the operator of the power station. The coal-fired power station consists of eight generating units including four 300MW sub-critical, two 900MW super critical and two 1,000MW ultra supercritical units, which were built over three phases. The first 300MW unit of Phase I was commissioned at the end of 1994. The power station reached the capacity of 5GW with the completion of Phase III in 2008. The plant currently accounts for about one-third of Shanghai’s total installed base. Alstom, which was responsible for the engineering of the Phase III boilers, was awarded a contract in July 2012 to conduct a boiler study at Waigaoqiao III to optimise the double reheat steam cycle for higher efficiency that might help the development of 700°C ultra-supercritical technology. The plant site covers an area of 144.4ha in the Gaodong, a town of the Pudong New Area on the south bank of the Yangtze River. Located about 18km from the Shanghai city centre, the site is bounded by Gangdian Road to the west and Haixu Road to the south. The Waigaoqiao power station uses bituminous coal from the Shenfu Dongshen coal field located in Inner Mongolia. Coal is transported by rail to a coastal port and then shipped to the Waigaoqiao power station in 35,000t shallow-draft coal ships. "The Yangtze River is the nearby source of water for cooling and servicing requirements of the power station." The Yangtze River is the nearby source of water for cooling and servicing requirements of the power station. The water used for boiler service is treated through clarification-sedimentation, reverse osmosis and mixed-bed resin demineralisation. The power generated from the plant is fed into Shanghai Municipal Electricity Power Company, the electric system of the East China Power Grid through two 500kV transmission lines. The phase I development of Waigaoqiao power station involved the construction of four 300MW units. The construction of unit one started in November 1992. The four units were brought into commercial operation in 1994, 1995, 1996 and 1997 respectively.The boilers, turbines and generators for the first four units were supplied by Shanghai Electric. 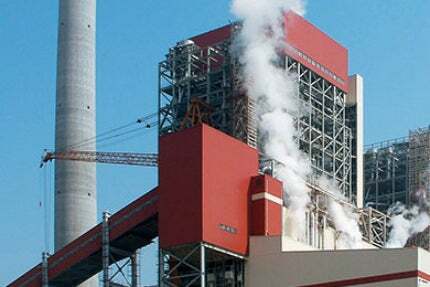 Two 900MW coal-fired supercritical units were constructed as part of the Phase II development of Waigaoqiao power station. The project was approved by the State Council in April 1997. The feasibility study for the Phase II, jointly conducted by East China Electric Power Design Institute (ECEPDI) and the foreign consulting firm Sargent & Lundy recommended two high capacity units based on imported supercritical coal-based power generation technology. The feasibility study report was approved by National Development and Reform Commission (NDRC) in April 1999. The boiler and turbines for the Phase II project were ordered in the same year. "A loan of $400m from the World Bank for the $1.8bn expansion project was approved in 1997"
A loan of $400m from the World Bank for the $1.8bn expansion project was approved in 1997. The construction of Waigaoqiao Phase II started in May 2001. The two 900MW supercritical units, the first of its kind in China at that time, were commissioned in April and September 2004 respectively. The coal-fired supercritical thermal units of Waigaoqiao Phase II with low NOx burners have an efficiency of 42% and are designed to burn low sulphur coal. Alstom provided the supercritical boilers and Siemens supplied the turbines and generators for the project. Hitachi supplied the instrumentation and control system built around its Hitachi Integrated Autonomic Control System-5000M technology. The Waigaoqiao Phase III power project, which has been operational since 2008, consists of two 1,000MW ultra-supercritical coal-fired generation units. The project owned by Shanghai Waigaoqiao number three Power Generation Company is financed and built by Shenergy (40%), GD Power Development (30%), and Shanghai Electric Power Company (30%). The Waigaoqiao Phase III with an estimated investment of $1.5bn represents the most advanced coal-based thermal power generation technology combining low coal consumption with high yet clean power output. The phase III plant is designed to produce every 1kWh of power consuming only 282g of coal. Moreover, the plant has a design efficiency of 46% as it burns coal to 600°C steam that passes through the turbines under a pressure up to 270 bars to drive the generators. The new plant uses the tower type boilers and dual pressure condensers. Both the units were installed with selective catalytic reduction (SCR) equipment for NOx removal as well as flue gas desulphurisation equipment. ECEPDI was in charge of the plant design, and Shanghai Power Construction Corporation (SEPC) was responsible for the construction. The boilers and turbine/generators were manufactured and supplied by Shanghai Electric under license of Alstom and Siemens respectively.Siemens provided main components for two steam turbines and one electric generator for the plant. Siemens also provided its SPPA-T3000 I&C system for the new Waigaoqiao plant. A 10MW ocean thermal energy conversion (OTEC) prototype power plant has been planned off the coast of Hainan Island in southern China. Jiangsu Huadian Jurong Power has selected Metso’s automation systems for its two greenfield 1,000MW power plant units located in Jurong City, Jiangsu Province, China.